Patrick El-Khoury and Grant Johnson wrote invited reviews for the emerging investigator issue of Chemical Communications Enlarge Image. 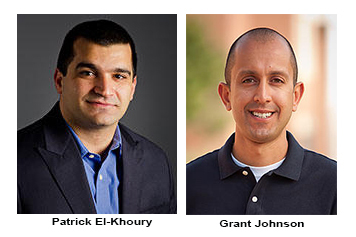 Congratulations to Dr. Patrick El-Khoury and Dr. Grant Johnson at Pacific Northwest National Laboratory on their invited articles in the emerging investigator issue of Chemical Communications, published by the Royal Society of Chemistry. The issue highlights work by internationally recognized, early career scientists who are making a difference in their fields. El-Khoury and Johnson are answering questions about the properties of extremely small structures that could, one day, change how we produce energy and manufacture chemicals. Light into Electricity: El-Khoury’s research with Dr. Ashish Bhattarai, also PNNL, mapped light-induced current generation at plasmonic junctions. These junctions are very small gaps formed between interacting silver nanostructures. To measure the current generated on a corrugated silver surface, El-Khoury and Bhattarai used tip-enhanced Raman scattering. This emerging technique also allows them to use different molecules to measure electric fields variations at sub-nanometer resolution. This tip-enhanced Raman nano-spectroscopy thrust emerges from El-Khoury’s chemical physics efforts to develop new ways to look at plasmons, molecules and their interactions. To date, he has co-authored more than 50 journal articles. Before coming to PNNL as a Linus Pauling Distinguished Postdoctoral Fellow, he completed postdoctoral training at the University of California, Irvine. He earned a Ph.D. in photochemical sciences from Bowling Green State University and a bachelor's degree in chemistry from the American University of Beirut. Surrounding Gold: Johnson’s work with Dr. Marshall Ligare, Dr. Erin Baker, and Dr. Julia Laskin, PNNL, focused on the structural evolution of tiny gold clusters encircled by molecules, or ligands. The clusters have highly tunable properties that could help catalyze manufacturing reactions that produce more materials with less waste and use less energy. However, the role of the ligands in the synthesis, stability, and reactivity is unclear and remains a subject of debate between synthetic and theoretical chemists. The team took a systematic approach to understanding the ligands. They started with an eight atom gold cluster surrounded by seven large ring-based structures, or triphenylphosphine ligands. They then, one by one, replaced the phenyl groups with smaller methyl groups. The substitution resulted in dramatic changes to the relative populations of two different structural isomers and subtle changes in ligand geometry that were characterized using ion mobility spectrometry mass spectrometry. Johnson began his career at PNNL as the first Linus Pauling Distinguished Postdoctoral Fellow. He is well known in the scientific community. He mentors students at the national lab and organizes seminars at conferences, both large and specialized. He’s co-authored 50 journal articles to date. He earned a bachelor's degree in chemistry from the University of Delaware. He went on to work with the U.S. Army before earning a doctoral degree at Pennsylvania State University. During graduate school, he received a fellowship to study in Germany and another to attend the meeting of Nobel Laureates in chemistry. El-Khoury et al. : A.B. was supported by the U.S. Department of Energy’s (DOE’s) Office of Science, Office of Biological and Environmental Research Bioimaging Technology project. P.Z.E was funded by the Laboratory Directed Research and Development Program at Pacific Northwest National Laboratory (PNNL). Johnson et al. : This work was supported by DOE Office of Science, Office of Basic Energy Sciences, Chemical Sciences, Geosciences, and Biosciences Division.